The print media industry is facing an uphill struggle due to increasing competition from the internet and other digital platforms. 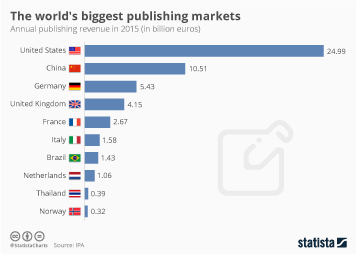 This can be seen by the fact that revenue in the newspaper publishing industry decreased by about 4.5 billion U.S. dollars between 2011 and 2018, and is expected to continue to follow this downward trend in the coming years. Evidence of this industry's struggles can also be seen in the fact that the number of employees has fallen from 256,800 in March 2010 to just 183,200 in March 2016. The New York Times Company, a major player in this industry, has faced similar financial troubles in recent years, with its revenue more than halving since 2006. Considering the recent decline of print media in general, many magazine publishers have attempted to adapt to digital disruption and ensure that they offer online content to supplement their print offerings. ESPN The Magazine has remained particularly successful, possibly due to the company’s presence across other platforms such as television and the internet. As of 2018, ESPN The Magazine had an audience of nearly 130 million people, making it the most popular magazine brand in the U.S. by a significant margin. The most common category of new magazine is ”special interests”, which illustrates that there is still a thriving market for small, niche topic magazines. Another positive feature to note is that he number of magazine readers in the country has actually been on the rise, with the number increasing from 210.7 million in 2012 to 225 million as of 2017. Once the saving grace of the industry, never failing to generate revenue, advertising spending has decreased dramatically. Advertising space revenue for example, which had been a mainstay of newspaper and magazine advertising for decades, brought in around 13.4 billion dollars in 2017, a substantial fall from the 16 billion U.S. dollars generated only four years prior in 2013. Advertising money seems to be drying up for all areas of the industry, with national newspaper ad spending falling to a low of 400 million U.S. dollars in 2018, and magazine ad spending halving in the past decade, falling to around 7 billion. Despite the fact that revenues are decreasing, magazine ads still remain highly effective at getting readers' attention; in fact, over 50 percent of consumers take note of advertisements regardless of their position within the magazine.